Review posted November 5, 2014. Atheneum Books for Young Readers, New York, 2014. 40 pages. This book is shelved with the biographies in our library, and technically it's nonfiction, but this isn't so much the story of someone's life as it is a true story that children will relate to and that makes a magnificent picture book. Arun Gandhi is the grandson of the famous Mahatma, Mohandas K. Gandhi. 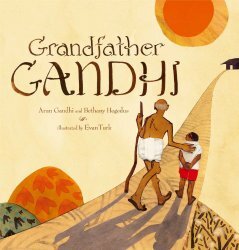 This picture book tells the story of when he met his grandfather, who was already a revered spiritual leader. He moved to the Sevagram ashram from South Africa when he was twelve years old, and had to adjust to no electricity or television, learning a new language, sharing his grandfather with many followers, new foods, and feeling like he could never measure up to the expectations of being a Gandhi. It seemed everyone around him was good at peace and tranquility, but Arun kept finding anger welling up inside him. Finally, after an explosive incident on the soccer field, Arun got to talk with his grandfather, who admitted that even he felt anger. But anger, like electricity, has two sides. It can strike like lightning and cause destruction, or it can work in a lamp and bring light. This story is specific to this boy’s upbringing, but it is universal in its appeal. Every child understands wondering if they will measure up to the expectations of others. And every child understands the difficulty of dealing with anger. The art in this book is striking, using collage including cloth and thread. I especially liked how Arun’s anger was expressed in a cloud of black thread encircling him and the resonant shapes done with shadows. This is a lovely book, and gently and without preaching is a vehicle for bringing up important topics. It’s all told from a child’s perspective, in a natural way, and will appeal to children and adults from any culture and any religion.